I know that it's probably not a challenge, but can you guess which combination of daughter-shoes this is? Yep, it's Jordan. 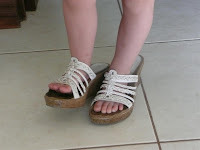 She has this thing for walking around in her mother's shoes and today she wanted a picture of her feet in the shoes.